You can rename them to suit your project needs, but if you wanted to have more than 5 types of equips and manage all of your weapons and armors using these additional equip types, you couldn’t. This script allows you to create custom equip types with their own equip slot names. 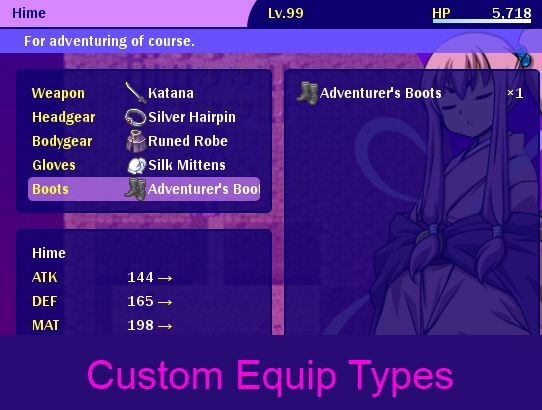 You can then assign custom equip types to different items, allowing you to create your own equip types. Combined with an equip slot script that allows you to add more slots to your actors, you can fully customize what your actors can wear and how they will be presented. 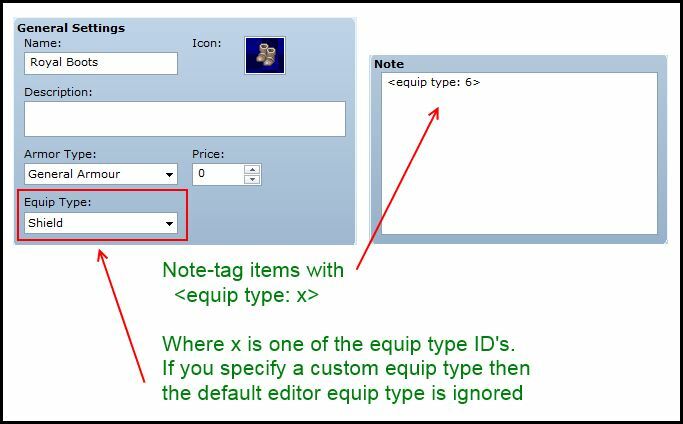 In the configuration section, set up the Equip_Types table with the custom equip types. Each equip type is given a unique number and a name. Where x is one of the equip type ID’s that you have set up in the table. A: In Core – Equip Slots there is a configuration called “Sort Order”. You must specify all of the etype ID’s that will be used. A: Your actor needs to have the features that allows it to equip the weapon/armor type. I am note tagging my item however it still deems it as . Any ideas or suggestions? # Set up your equip types here. # Default slots to assign to actor if no slots are provided. What I mean is, in Yanfly’s Ace Equip Engine, you can use the “Equip Actor with Armor X” command in the custom slots by assigning your armor to an default slot and it will automatically put for armor in your custom slot. For example, if you had a custom “Legs” slot, and an armor “Leather Leggings”, you could go to the armor page in the database, put the equip type as “Shield” (or any other default category), but put in the notes that “Leather Leggings” should actually be equipped in the “Legs” custom slot. Then, in an event, you can use the “Equip Actor with Armor X command”, and see the armor “Leather Leggings” listed under the “Shields” category. You can use this command to equip the Leather Leggings, and the script will override the “Shield” category and equip it to your custom slot “Legs”. You have duplicate method calls in one or more script. My issue is this: I’ve the note tags all set; even initializing equipment. What happens: all custom equip slots, upon starting, place the equipment back in the inventory. All the brackets are there, there’s no runtime error, just a52, a53, and a57 in my inventory, and cannot be re-equipped. I have the scripts needed setup as they are supposed to be, I wonder what the issue is? Needed Multiple Equip Types; got it and this is now no longer an issue. Oh ya, I separated the scripts since there may have been compatibility issues with other scripts. Perhaps the instructions were not clear. But with others, multiple tags per line do. I’m guessing that each script has to be programmed in this way. I’m such a novice. No, the instructions were not clear. Custom equip types do not support multiple equip types. If it did, the instructions would have mentioned it. 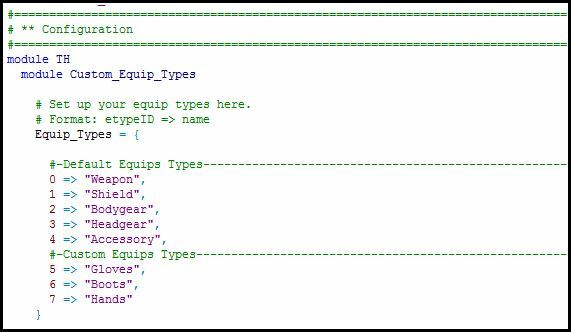 If you meant the “multiple equip types” script had confusing instructions, I looked at the usage and it mentioned that each equip type tag must be created separately. I’m having issues using script calls to change equipment in that it doesn’t seem to work for anything except the basic equipment types in their standard order. If the equipment is listed in a different order or is not one of the basic types then it destroys the item instead. Specifically I’m trying to get Falcao’s Tool selector working with either your system or Yanfly’s similar script and I can’t. But the fact that even change_equip script calls don’t work suggests that there’s something fundamentally broken with change_equip commands when using extra equip types. Is there something special that needs to happen in a script call to change equipment? If so I’m pretty sure I could make Falcao’s script work myself, but I’m totally lost on how to approach the problem. Does this issue occur when you remove falcao’s tool selector? Yes, that’s trying both $game_actors[id].change_equip_by_id(slot, equip) if $game_actors[id] and $game_actors.change_equip(n,$data_weapons) syntaxes for changing equipment. If #1 fails, then the script has bugs, but I have not had any issue with it on its own or with my other equip scripts. If #2 fails, then the issue is another script in your project. I should’ve spoken more clearly. The issue occurs even in a fresh project where only your two scripts exist. $game_actors[id].change_equip_by_id(slot, equip) if $game_actors[id] works perfectly fine for Weapon and Bodygear when those slots are in those default positions, but nowhere else. For custom equip types it doesn’t work at all (and eats the item into the void for some reason). and had the exact same results (I don’t think those two things are functionally different anyway?). Then I tried with simple Change Equipment calls and still the same problems . The script works perfectly fine for just manually equipping stuff through the menu screen, but I can’t get outside equipment requests to work. Should I send you my otherwise blank testing project where it’s not working properly? Nevermind, I solved it. I thought I had tried this early on to no success but I guess I hadn’t. You have to specify the slot number based on where it is in the list, not what type it is. So if the custom item type “Tool” is slot type #6 but is #8 in your list, all script calls need to reference slot 8, not slot 6 (and of course subtract 1 from that cause the first slot is 0). If that’s obviously stated somewhere I must be missing it cause I couldn’t find it said directly. I think it might be nice to add a line to the instructions for the script on on your site for the dense people like me who are still learning how RGSS3 actually works. Anyway, thanks for your time and sorry for the alarm. Glad I got it worked out at least. There may be a bug somewhere in my code. Assuming you have set up your actor with 6 equip slots, in the equip scene, the "Tool" equip slot will appear as the 6th slot on the list. When you use change_equip_by_id, you specify the slot ID, which is the order that it appears in your equip list (minus 1, because Ruby). When you change equips, you should be changing equips by slot ID, not by equip type ID. To be the correct script call. If this is not the case send me the project and I will look at what's going on. No I think it’s working fine. The mistake is with this: “When you change equips, you should be changing equips by slot ID, not by equip type ID.” I never saw that spelled out anywhere, and thought it was the opposite. For some reason I thought I had tried doing it by slot ID, but apparently never tried it (otherwise would have solved the problem earlier). All the documentaiton for equip change I’ve seen anywhere says 0 for wepaon, 1 for shield, etc. – because those are the default slot IDs, but they also happen to be the dfault equip type IDs. Hence the confusion. As I said, unless I’m missing it somewhere, it might be nice to make that explicitly clear in your documentation of the script. Or maybe I’m the only one who’s made this mistake before? Anyway, the issue is totally solved and I don’t think there’s an error with your code (at least when it comes to this). I will add a note in the script. Yes, there is a script called “Multiple Equip Types” that I apparently did not list under the add-ons. See if that works for you. Let’s say that I have a custom equip type called “Boots” and its etype ID is 6. Is there any way to check if a particular character has Boots equipped? ANY boots, no matter which ones. I know I can check for each individual item, but if I have – for example – 33 items that are Boots I would need 33 conditional branches per character. Is there any way I can do it with a single conditional branch that checks the etype ID instead? item.etype_id will return its etype ID. You will have to figure out how to get the item object. Utils: Equip Checks may be good for reference. Question: How do I “fix” a custom equip type? For example, let’s say equip type 6 is “Boots” and a character starts the game with a pair of cursed boots that he cannot remove until a quest is completed. How do I do that? The “Fix Equip” feature works for the default equip types, but what about the custom ones? Then slot 5 is there, correctly without initial equip, but the initial equips on all other slots are in the inventory, but not equipped. You&apos;re right, I actually did notice that behavior before…but never really thought that it was a bug. And when I looked into it, turns out I wasn&apos;t even considering the possibility that there could be slots that were initially empty. I&apos;ve updated the script to address the bug. Is there a way to assign multiple slot types to one item? I tried it, but it only takes the first number. If there is no built in way, is that something easy to add? There are existing scripts that already provide multiple equip types (one is presented there) and it seems to work fine. Thanks, I&apos;ll try it out. I don&apos;t think Multiple Equip Types works with your Equipment scripts. 🙁 I&apos;ve tried it above and below and with and without your note tags, but it still won&apos;t show up in both categories. Roguedeus might have made some modifications of his own to get it to work. with my gloves tagged with equip type: 5 (with the brackets which I can&apos;t type in here) but no gloves/boots appear in the equip section. This doesn&apos;t work in a new project? It&apos;s a pretty new project in general, it doesn&apos;t have any scripts that should have compatibility issues with your scripts so i&apos;m not quite sure why it&apos;s having issues. Your actor needs features to be able to equip them as well. The slots are there for the actors, the issue is when you try and equip an item to those slots it&apos;s not showing any available items. Ignore my last comment, i&apos;m a moron, thanks for your help! coughs Um. Hime? You&apos;re wearing casual clothes on your head. Yes. It looks like it demonstrates that you can make it so that you can wear anything anywhere. I can’t justify what happened there. Can you help me out? I add <equip type: 6> to a pair of "Boots", but the boots won&apos;t appear in the equip selection. Did you set the equip slot as type 6?